A design festival was held by the Adelaide City Council in 2012 for emerging architects to put forward their ideas for park sculptures and focal points. 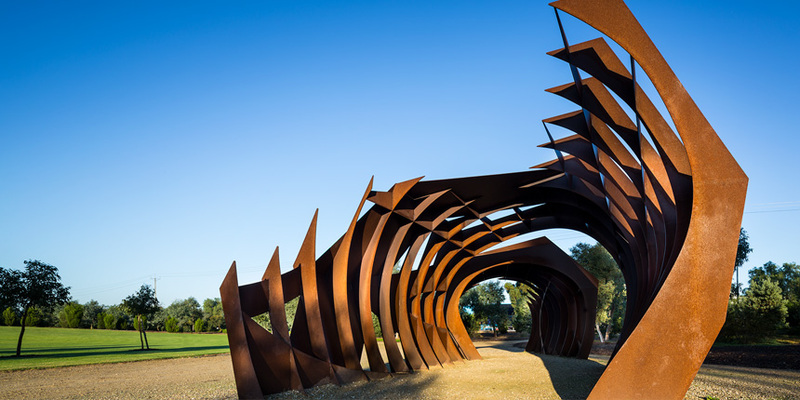 One of the resultant designs was that from two architects, Stephen Hooper and James Martin, for a “Conceptual Park Shelter” which the Adelaide City Council decided to turn into reality. A metalworking company was commissioned to manufacture and site-weld the shelter, which is approximately 9.0m long overall x 3.10m high x 5.0m wide at its widest point. The sculpture was fabricated utilising 6mm “CoreTen” steel plate with an INTERPON “SABLE CORE TEN” powder coat finish, available only in sheets 1220mm wide x 6.0m long. Wilde and Woollard was commissioned early in 2013 to provide a check-price for the works to the council, as there was only one fabricator prepared to undertake the project in the required time frame. It was necessary to actually plot the individual steel components onto butter paper to calculate how many sheets of steel would be required to comfortably satisfy the task at hand. We then had to estimate the cost for laser-cutting, shop fabrication and welding, and site erection and site welding. Our figure must have been correct, because the image is of the actual finished sculpture. “CoreTen” finish on the steel plate was chosen for the sculpture because the resultant rusted appearance of the structure gives the impression that it has been there for millennia, (or perhaps just hundreds of years), which matches the somewhat “outback” colour of the sculpture’s surrounds. The final sculpture was named “Native Bee Memorial” and is certainly reminiscent of the thorax of our native bee.